The Pacific Fashion Festival is a cultural spectacle of art, design and history translated into fashion. A show not to be missed! On the platform of the Pacific’s largest island, Australia, we are able to link all the islands from Australia, Fiji, Papua New Guinea, Indonesia, Samoa, Tonga, Vanuatu, Solomon Islands, Hawaii, Kiribati and many others. This is a culturally rich exchange that empowers these emerging markets to create business opportunity and become strong participants in the fashion industry and its supporting industries. 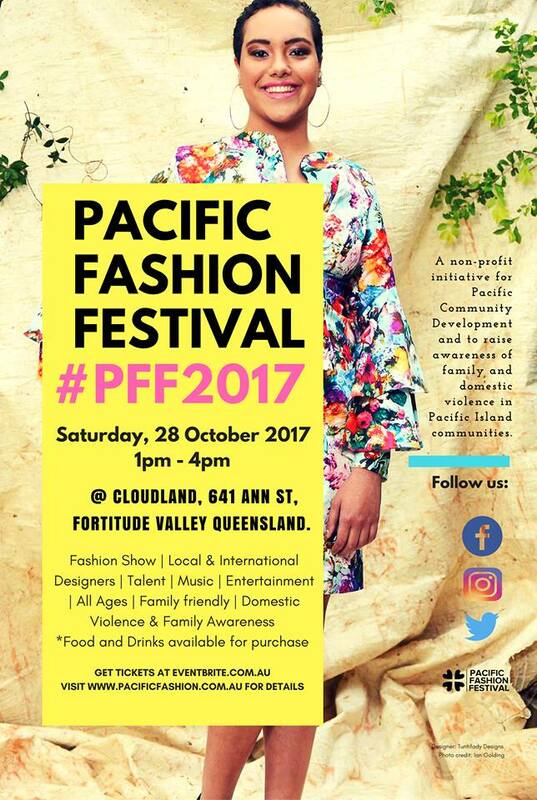 Pacific Fashion Festival is created to showcase, develop and nurture talent for the economic empowerment of our Pacific communities whilst advocating against community, family and gender violence. Proactive and creative advocacy aligned with cultural celebration shines a light on an issue very hidden and shamed in our communities to create an open and safe dialogue. We endeavour to create a culturally rich platform that empowers these emerging markets to create business opportunity and become strong participants in the fashion industry and its supporting industries. Australia is a world stage that allows multicultural communities to participate in a cultural exchange of endless beauty and is also a vibrant market viable for endless opportunity in a competitive market. Dress theme for our audience is “Colour me bright”. So wear your bright colours and dress to dazzle. Pacific Fashion Festival is a social enterprise creation by The Leniata Legacy and all profits are reinvested into building this platform for the empowerment of our communities whilst excess monies are then allocated to Papua New Guinea for the cause of gender-based violence and sorcery-based violence in Papua New Guinea. 2016 profits were dedicated to Femili PNG in Lae and a victim of false-accusation-violence relating to alleged sorcery in Chimbu, Papua New Guinea. Previous Post Purchase your tickets to our final event of the year – PWA Aloha Night!